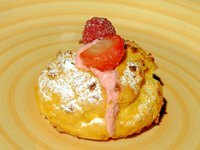 Cream puffs are a small dessert made with a cream-filled baked pastry dough. The dough, French pate a choux, becomes an airy shell when baked. The dough can be made ahead of time, frozen and filled just before serving or you can fill the shell and serve it just after baking. Leftovers from large batches can be frozen until later. Prepare cream puffs by following a recipe found online or in a cookbook. Recipes consist of a dough and a pastry cream filling. Place the prepared cream puffs on a baking sheet covered with wax paper at least ½- inch apart. Place the baking sheet in the freezer until the cream puffs are frozen, about 30 minutes. Transfer the cream puffs to a container such as a plastic bag or plastic container for future use. Prepared and frozen cream puffs can be reheated in a 350-degree oven until heated through, prior to serving but do not need to be thawed before reheating. Can I Make Stromboli the Night Before Without Baking?